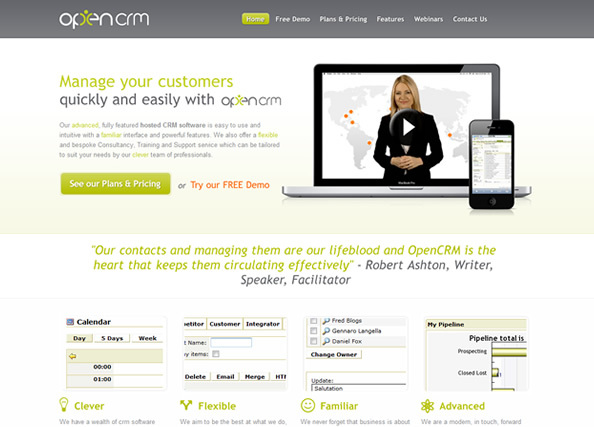 OpenCRM is a leading supplier of advanced, familiar, flexible and clever CRM software. OpenCRM stand out in a crowded sector by providing hugely competitive pricing, second-to-none customer interaction and cutting edge software to their customers. OpenCRM approached Union Room and Projector earlier this year, looking for a website and branding that would reflect the stellar service they provide. After an initial round of meetings (and a trip to their stunning offices in North Yorkshire), we were delighted to get a start on the project. “When we were approached, OpenCRM traded under the name ‘Software Add-Ons’ and ‘OpenCRM’ was one of a number of products sold by the company. It had, in fact, become the core product of the company and the name was more widely known than that of the parent brand. The management team recognised that this was something they could turn to their advantage in helping to grow the business for the future; they just weren’t sure how to go about it. We were appointed to reposition the brand and create a coherent message for their audience. Our initial research involved interviewing key stakeholders to unearth the true perception of the brand and this combined with Q&A sessions with the appointed marketing team gave us the foundation to build a new tone of voice. We filtered the information gathered through a number of key steps to come up with a proposal which set out a number of values to act as the ‘essence’ of the new brand; Clever, Flexible, Familiar, Advanced. The colour pallete, photography and copy style were all then developed on from these key values. We created a new logo to represent both the product (which essentially holds data about clients, staff and suppliers – in other words information about people relating to the business) and the above values. A figure became part of the word as a subtle yet clever hint towards the product offering and we used the typeface, shapes and colours to begin building the values visually. A full set of corporate stationery was produced alongside an HTML email template and a new website by our colleagues at Union Room. We also commissioned a copywriter to bring the key messaging in line with the newly established brand guidelines”. We were delighted with the branding created, and it gave us a perfect starting point for the design of the new website. After passing the website designs over to the OpenCRM development team, they then took that and integrated it with their content management system. They’ve done a fantastic job of converting these. Keep an eye out for further work on the OpenCRM website in the near future. In the meantime, take a look at the live website.